I'd heard lovely things about Aquaria, the beautiful underwater adventure for PC and Mac. It was an underwater 2D throwback of a game, an action-adventure with mysterious new-agey music and a good story. But I haven't play it on the computer. I've played it on my iPad, for which it went on sale last night. It's handled the transition well, with just some manageable control issues. Aquaria lets you control an underwater nymph named Naija who can swim through a massive underwater world filled with colorful aquatic animal and plant life. She narrates her own story of conflict and re-discovery. The game plays like a mix of Metroid, Zelda and old shooters. From Metroid and its imitators the game gets its massive world, a network of caves and temples waiting to be explored. The game's grand map is filled in as you do this, just like in the classic Nintendo series. And, as in Metroid, many areas are initially locked off, but Naijia gains powers that make formerly bocked passages accessible. From Zelda the game gets both its core puzzle-solving mechanic—the learning and playing of magical songs—as well as its old-school tendency to not give away its puzzle solutions or even aggressively point the player where to go next. From shooters it takes the fact that Naija can convert to a non-singing magical form that can blast underwater enemies. 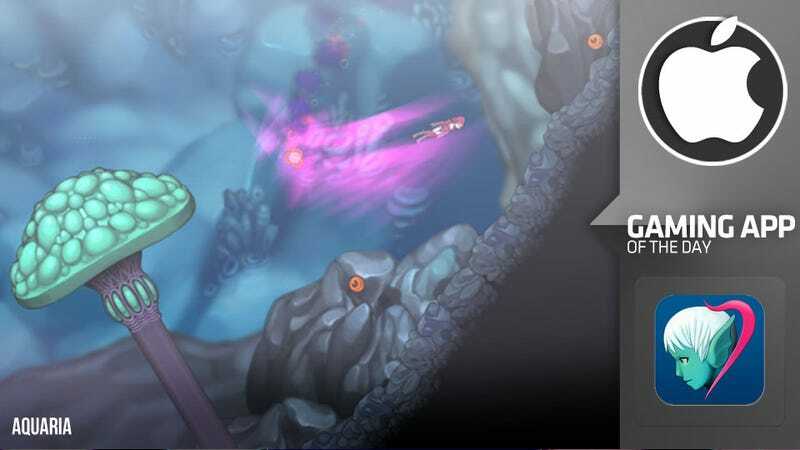 The game warns players early on that they can be lost, a fact that will either entice you or ensure that Aquaria is not your kind of iPad game. You have to figure a lot of things out yourself and you may find yourself swimming through the world wondering what to do next, stopping at various exotic spots and tinkering with the environment, singing various songs, poking and prodding until you get the eureka of progress. That kind of old-school style and lack of hand-holding suits a game that also asks the player to do things like collect food items to collect recipes. This is a throwback indeed. It will mostly be taste that determines if this game is for you, though eager gamers should be warned that there is a control problem: namely, the fact that human hands are not transparent. You will need to tap your fingers both near and far away from Naija, depending on whether they want her to sing, dash, cling to walls or what have you. You'll also need to play two-handed when it's time to convert her to her energy form and shoot bad guys. This means that the player's hands can never just cover one area of the screen; they'll need to repeatedly interfere with the view of the action, pressing various parts of the screen. The more you play, the more you get used to this, but the big-handed among you may find this frustrating. The game has depth and charm. It looks wonderful (see the iPad launch trailer in this story). Control concerns aside, it's really a matter of whether you want an old-school adventure that won't hold your hand. On the iPad, there are few alternatives to choose from, for better or worse. This one would be a good pick.